Girl Kuripot Girl Kuripot: @KBSWorldRadio, Join the Speak in Korean Video Contest - Win a Trip to Korea! 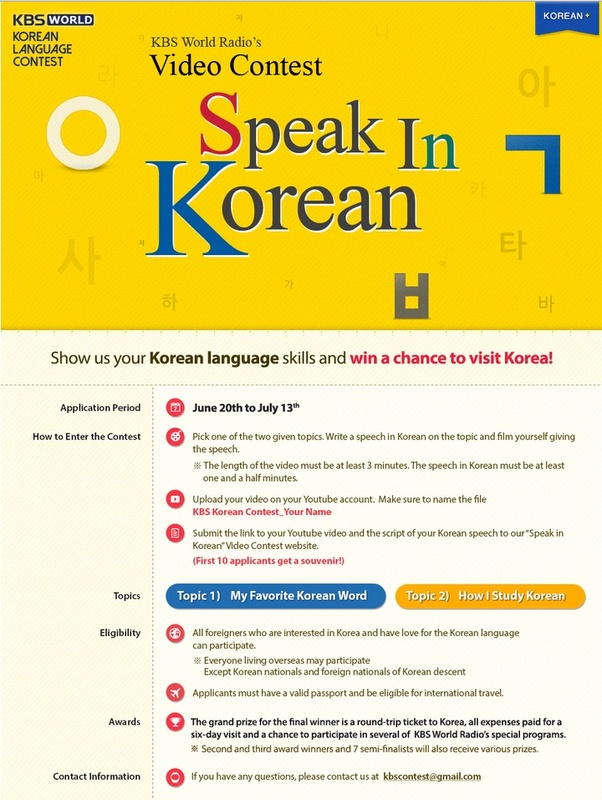 @KBSWorldRadio, Join the Speak in Korean Video Contest - Win a Trip to Korea! This is a chance to win a trip to Korea! To join, Upload a 3-minute YouTube video on either of these topics: My Favorite Korean Word or How I Study Korean with the correct name format. Submit the details (fill up application) to their website. You have until July 13, 2014! Click here and here to join the KBS Radio World Speak in Korean Video Contest.